I am seeing pompano, sheepshead and mackerel arriving every day. It’s always good to see these fish coming into the river again. Action can get pretty exciting this time of year. Paul and Walter joined me on a breezy morning and the guys found the drum biting good. They landed nine and had a few breakoffs along with sheepshead, snapper, jacks and others to make for a fun morning on the river. Don, Art and Sherman were back up to fish this month. They caught some nice sheepshead along with snapper, grouper and a host of other fish. Sherman landed four snook to 24″ as well. It was another fun week on the Indian River. Look for mackerel around the inlets and turning basin hitting small shiny lures. 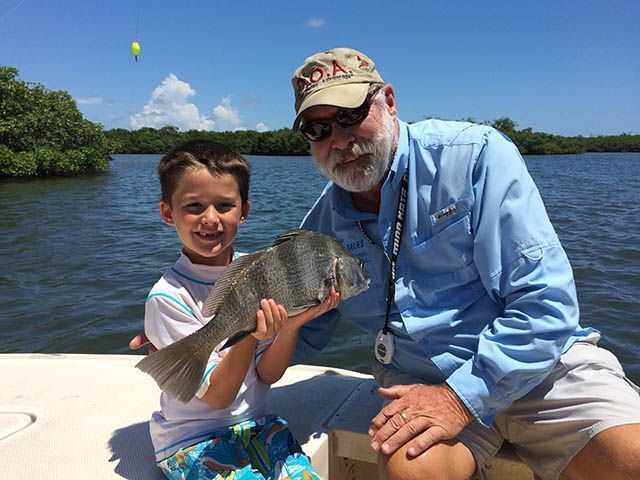 Drum and sheepshead have been plentiful around docks, bridges and channel edges. Snook have been around the inlet areas as well as bridges and docks. Redfish on the flats and mangroves can be found with DOA shrimp. The trout bite has been improving north of Fort Pierce on the grass flats towards Harbor Branch and Queen’s Cove. DOA Deadly Combos are great tools to find the trout. Pompano have been scattered, but more are arriving every day. It should be a good pompano season this year. Jacks, ladyfish and blue runners have been thick in the channels and inlet areas. If your just want some rod bending action, especially for the kids, get out and enjoy the fishing this month!